The “Forest at the Edge” series, by Trish Mercer, explores what transpires when a government limits the knowledge and freedom of its citizens. The main characters are a school teacher, Mahrree Peto, who isn’t as discreet or compliant as she should be, and an army captain, Perrin Shin, who privately doubts the government because it clashes with his spiritual beliefs. When these two get together, they think their quiet rebellion will go unnoticed since they’re at the remotest village called Edge of the World. But the chairman of the government, Nicko Mal, doesn’t tolerate any dissent, no matter how subtle, so he takes a personal and vindictive interest in them. The first five books of the eight volume series are currently available at Amazon, Smashwords, and Scribl. Astronomers estimate there are 160 billion (yes, with a “b”) alien planets in the universe. So what might life be like on just one of those 160 billion worlds? What might God’s Plan of Salvation look like on another planet? That idea is what drove me to write the “Forest at the Edge” series, to explore how God’s gospel might be manifested in another part of the universe. So far I haven’t found any genre of literature which tackles this point of view, so I’ve struggled finding the correct niche for my books. The books are not, however, “sci-fi” because there’s no speculative science in them, although exploring life on another world seems to fit the bill. So I’m out here writing about a Christian society which originates, lives, and dies on a planet somewhere else than earth. And oh, is it fun! 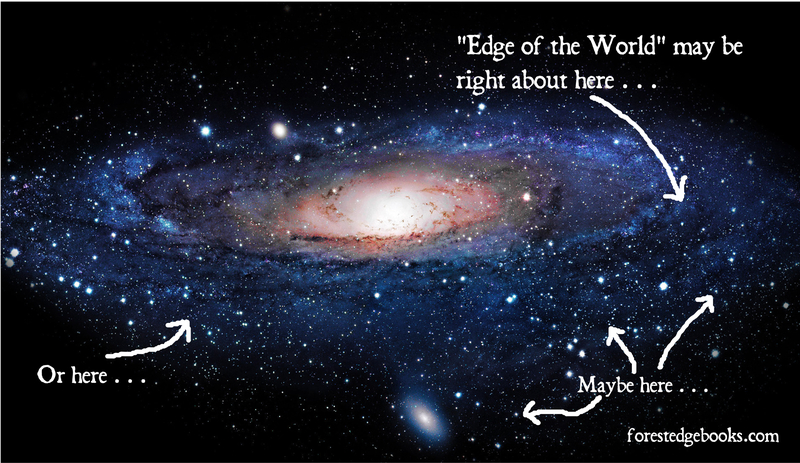 What would a God-directed creation look like on another planet? How would He populate another world? What kinds of limits, terrain, people would be there? What would their belief systems look like? I think they’d look a lot like ours. I wholly trust that there is life on other planets, but aliens aren’t creepy blobs or elongated masses with telepathy, or even possessing Spock-like ears. “Aliens” look just like us: human beings made in the image of our shared Father in Heaven. (Animals, however, may likely be very different than our earth’s, but I’m not creative enough to come up with those so I stole earth’s animals for my series). At the heart of that human experience is the test of our wills. What do we want more: to follow God and His will for us, or to follow after our own impulses? And at the root of that is our ability to choose what we worship, how we live, and what we pursue. But as I’ve been writing this series, something fascinating has happened: each year those choices become more restricted by those who would control us. Suddenly I realize that what I’m writing is about supporting religious freedom. Today, in 2015, I declare that our freedom to “worship how, where, or what [we] may” will soon be under hot and direct fire. 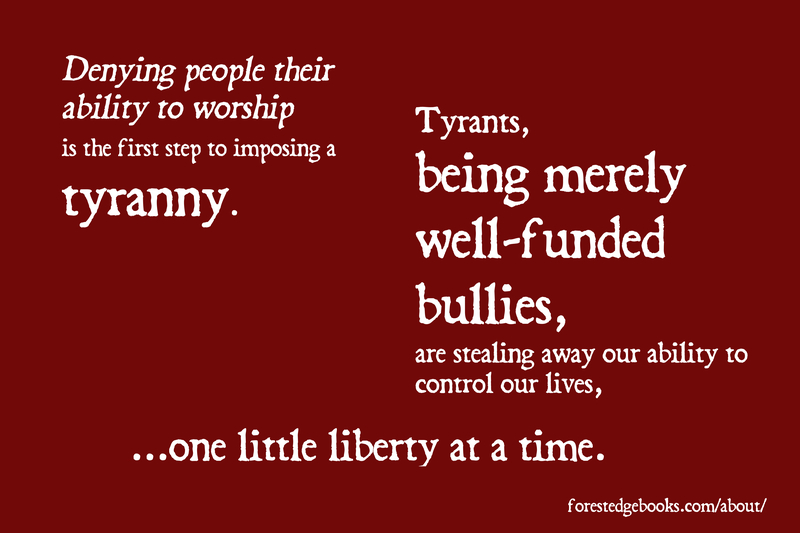 Denying people their ability to worship is the first step to imposing a tyranny. Tyrants, being merely well-funded bullies, are stealing away our ability to control our lives one little liberty at a time. I’m warning you right now, the world truly is out to get you. Doug, thanks so much! I love the observation you make about your kids, and how they’re so accepting of others. Just watch kids at a public playground involving everyone, then watch their parents, sitting separately. I wonder at what age this change occurs? At least we as individuals and parents can try to keep that open acceptance and mutual celebration alive in our families, and maybe we can reverse this trend. Love your work Mrs Mercer. It does seem a sign of the times doesn’t it, where intolerance seems to even be preached in some churches these days. I remember times when tolerance used to be taught in church, and encouraged, and other beliefs were acknowledged, and you were encouraged to try and understand them (and if by chance you found that other belief more fitting for you, then that was celebrated). Now a days, it seems that belittling, insulting, or even outright hatred of other beliefs is the norm (and no longer the exception). I look at my children (6 year old boy, and 3 year old girl), and there’s a just a joy of the world in their outlook. And you watch children that young play, and the acceptance of other children into their play is how the world should be. Intolerance is not something children come up with themselves, unfortunately, it is something that is taught. How wonderful the world would be if we would all just “channel” that inner child and realise that accepting everyone, regardless of the beliefs, can be just as rewarding as when as children we welcomed other children into our games.